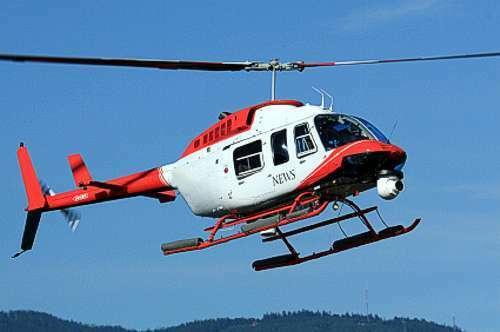 Leading agencies in television, radio, and the print media, all who wish to enhance their coverage capabilities to their customers with aerial footage and short-notice or long-reaching media events, are increasingly relying on aerial footage from helicopters to provide them the ‘edge’ in today’s growing and competitive news gathering market. Media competition fuels the need for an aerial platform which can provide unparalleled market penetration and coverage options. This can include special event coverage, or breaking news events which are not possible to be adequately or effectively portrayed to the public through conventional land-based video coverage, or whose breath of scope or immediacy require quicker response and more flexible coverage options. SRT can provide simple media transport to expedite on-site response for breaking news events in distant locations across the viewing area, acquire airborne video clips, provide “Live” aerial video or audio broadcasts, or simply to compete with live internet streaming video feeds from independent agencies and news sources. Photojournalism can reach new proportions of insight, perspective, and completeness. SRT Helicopters is locally owned and operated, and dispatched 24/7 to insure more immediate and thorough coverage of breaking news or local and distant events. Helicopters can stay above and out of the way of emergency services, while simultaneously providing large view coverage, awareness, and documentation of critical scenes and events. In contrast to traditional fixed wing options, SRT can provide many media outlets an improved and unmatched aerial platform from altitudes as low as 200 ft., as opposed to 1000 ft, and speeds of 30 knots instead of 80 knots, and even stationary hovering.